Blogging: because I feel I should finish what I've started. The Barrier is a far cry from Shankari Chandran's Sri Lankan debut novel Song of the Sun God (a family saga, set in Australia and Sri Lanka over several generations - the kind of book that wins literary awards). The Barrier is a thriller set in a dystopian post-apocalyptic world, a world looking more and more like the present (I suspect the author wishes she was less prescient!). Travel between East and West is banned (a Muslim travel ban, written pre-Trump) and information and biotechnology are used as weapons. The author has created a future world order that lays bare the present day hypocrisies - the rhetoric of democracy, security, terrorism and the axis of evil have travelled from 9/11, down the decades to this novel's near future (2040) setting. The Barrier asks big external questions about the world, but also some big internal questions. It explores what happens when there is head with no heart, thinking with no feeling and biotechnology becomes more important than people's souls. I have read some spoilers for this already and I cannot wait to get my paws on an actual copy! Only another month til it's release! Wheeee! Unusually for nursing school I was at a table with three men (boys?) today. I have had classes with all three and am quite friendly, but one of these young men is someone I count as a really good friend. More than just a contextual 'uni friend' the guy is someone who has said the right thing to me when I was upset, helped me when I wasn't really managing and he's someone I really trust, which is so important to me. I used to have lots of male friends but now I only have a few. I really value this friendship but sometimes I ask myself 'can men and women really be friends?' Not for the usual reasons people ask that question but because of the power imbalance that lets men completely discount what I say because it doesn't suit their reality. As we sat in class today I was chatting and trading cheerful insults with the table opposite while I waited for you, or one of the others at the table, to tell me what your internet searches had found on our topic. You teased me for me noisiness, asking if we were going to get any work done. At the time I made some snarky remark but I felt like I'd been slapped, and a gut-dropping, chest-tightening sensation of shame. I had been silenced and I wondered if my cheeks were flaming because they sure felt like it.We set about our work and somehow I managed to stay light, and over the half hour or so I managed to get back my equilibrium, but you didn't notice that whenever one of you spoke I hurried to shut up, not wanting to be accused of being the noisy one or talking over any of you or controlling the conversation in any way.When the teacher asked who in our group was going to present our ideas to the class I tried to make eye contact with all or you. I said your name; "you do it" but the three of you refused to meet my eye. This is important - I was comfortable talking for our group but I not only checked if someone wanted to do it, I pushed each of you individually to get up, not wanting to get in the way of a learning opportunity for any of you. None of you declined politely, you all flatly refused to engage in any way, leaving me with choice of pretending I didn't exist and hoping the teacher would pick one of you, or just getting up and doing the job we had to do. As you know, I got up, muttering curses in the direction of the table but as I sat down in front of the class you said, if a quiet voice designed to carry, "she loves it" and again I felt my cheeks flare. Our teacher, who had commented to the class on the fact none of you would make eye contact and that your refusal to volunteer had made it my obligations, then made a joke about you having given up your right to speak when your inaction forced me to volunteer. And that was the point when I nearly lost my cool altogether. I think I spat 'when a woman says no she means no' at you, which wouldn't have made sense to you at the time but what you did was remove the power of choice from me, forcing me to do something against my will, and then despite evidence to the contrary you said that I loved what you had done to me. Again I was humiliated, but because I'm really good at faking it, and because there was a class full of people watching me, waiting for me to talk I pulled myself together, squashed those feelings of betrayal down into a box in my already broken heart and proceeded to comfortably lead the discussion for the next few minutes.I know you didn't mean to upset me or publicly humiliate me but you need to know that your words have weight, your teasing and jokes can trigger nasty feeling from the past and that patterns of speech and behaviour have context in power imbalances. Gender inequality is a real thing and if you can't see it it's because your privilege has allowed your blindness, not because it doesn't exist. For my part, I'm sorry I can't talk to my friend directly about this and I'm sorry that things said in jest can start an avalanche of feelings that don't all have much to do with the here-and-now. I wonder if I'm brave enough to send this to him? I have been falling down internet rabbit holes on organising recently. I'm reading about Project Organize me Entire Life, reading reviews of ring bound vs disk bound day planners and gazing at endless filing systems on Pinterest. I spent about three hours in Officeworks last week. This obsession is sucking my time and I recognise it as something with more complex motivation than just wanting a new way to get paperwork in order. As I was wandering around the house looking for the plastic-y stand-up sticky notes that I remember seeing somewhere (If you must know I needed a temporary way to label my folders before I commit to catagories using permanent marker) I had a sudden epiphany - there are things in my life that I can't just organise away, much as I wish I could. As Sanjay and I are splitting up, and I'm currently waiting on paperwork from him, I don't know when I am going to move out of this house, I don't know how much money I will have available to rent or buy an apartment, I don't know where the kids will go to high school, I don't know whether I will pass uni (it's likely - I haven't failed a subject yet!) and graduate at the beginning of next year, I don't know if I will get a new grad nursing position, hell, I don't even know if I'll be able to do a new grad program considering I will have 50% custody of my kids. Writing it down makes it obvious. Organising is channeling the anxiety related to the vast quantity of really major unknowns in my future (including the 'unknown unknowns' - worrying about them came free with my anxiety!). It is also serving to focus me on something I can do, although it distracts me from more useful pursuits (I'm an expert procrastinator but this is ridiculous. I have heaps of uni work!) and it's a weird form of escapism, just like looking at IKEA catalogs where we imagine perfect lives for ourselves filled with light and swept floors. So now I will try to get some uni work done without being quite as distracted by the various online rabbit holes. I will be a bit kinder to myself, now I know it's not just laziness that is pulling my attention away from what I need to do, acknowledge what the distraction is giving me and make time as I drift off to sleep to imagine a world where paperwork doesn't rule my life. At least one thing is for sure, I now know I want an A5 sized planner with a whole heap of fancy custom inserts from Etsy. I realised at ten past one this morning that I had just spent 5 hours looking at folders, after countless hours over the weekend. I peeled my eyes away from the computer and went to bed, only to lie there awake and bug-eyed for another hour or so. Either the anxiety is out of control, I have a very special procrastination superpower, it's a weird ADD symptom or I'm having the most boring manic episode in history. Not sure whether to ask for dexies, benzos, mood stabilisers or just give myself a swift smack around the chops for being lazy. I will ask kind Dr S when I see him. I picked the chookens up the day after my birthday, so we've had them here for about 10 days and I'm still reasonably besotted. spending 40 mins in a box. The people we picked them up from (City Chicks in Marsden Park) were just lovely. They showed me how to clip their wings, they let my little boys go exploring in their yard, showed them baby chicks and the advice they gave about feeding and husbandry all seemed very sane and matched with what I have read already. We got home late afternoon and popped them in the coop. I fussed around trying to make sure they knew where food and water was located (we are using Dine-a-Chook and Wet-a-Chook for food and water - a bit different to what the chooks were used to, so I put some scratch grains (AKA chicken treats) around the feeder and even inside the feeder and the hens got the idea at once). 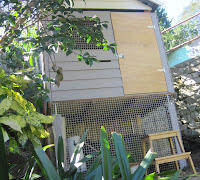 The black chicken (an australorp cross) managed to escape and I realised that she was the feisty one. The kids had their first lesson in chicken catching (slow, quiet, no sudden movements and try to corner her) and I discovered that hunting a black hen through the shrubbery at dusk was something akin to trying to catch a shadow. Luckily it only took us a few nervous minutes! The next morning I heard some noisy clucking, and when I went to check on the girls I found TWO EGGS! We haven't had two eggs every day since, but we've had one egg most days (and one hen hasn't come into lay yet). When chooks are stressed they stop laying, so the fact that despite the big move, and despite the kids wanting to pat them and talk to them they are still laying, albeit not perfectly regularly, is fantastic. 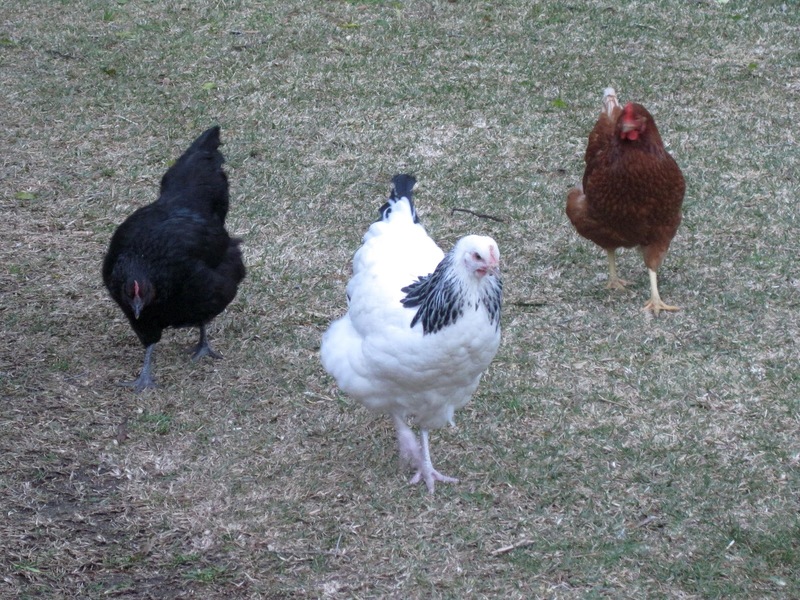 They were named mostly by the boys - Kiz sayd he wanted the brown chooken to be called Henny Penny, so that was fine. I wanted the black one to be called Kali and Asher wanted them all to have the word 'hen' somewhere in their name so the Light Sussex became Henrietta and the black chicken became Henny Kali. So far the thee chooks are doing everything I'm 'paying' them for. Providing eggs, teaching the kids about caring for animals and providing all of us with amusement (Asher said to me yesterday "We have the most fascinating chooks mum!"). Of course, I now need to get the planned raised beds with bird netting sorted pronto, and some more fencing organised - the chooks are scratching up my seedlings, stomping on my new lavender, discovering new and creative ways to escape, pooping in remarkably inconvenient and I strongly suspect Henny Penny has started laying her eggs under a bush or somewhere because the last few days have only been one-egg-days. Despite all that, they are funny and friendly and the whole family is glad we have them. The girls saw the treat bucket! It turns out that I'm far less inspired to write now I'm in therapy. I'm not really sure why, but I'm going to give it a try because Sanjay reminded me I won't remember when Kiran's milestones happened if I don't write them down, and I won't write them down if I'm not blogging them so here goes. Life over the last year has been pretty fraught, but isn't it always? I feel like I just lurch from one crisis to the next. Not that these crises are always terrible, or necessarily negative at all, just times when life requires more than I thought I had to give. There are tough times for a whole bunch of people - a dear friend had a rather serious breast cancer scare and another close friend's preschooler had open heart surgery and yet another one of my closest people has a horrible infection that is proving very difficult to treat. There are others having dramas in their personal relationships and tough times with their kids. I don't think I dwell on this stuff too much, but I'm conscious of all of it all the time, sending my love and good thoughts out to these people I love that are having difficult times. I have also been the recipient of lots of love and good thoughts - as many people know Sanjay and I are in the process of divorcing. I'm not going to go into detail here and now, except to say it's been a long time coming, it hasn't been an easy decision for us to make and that our focus now is on the kids and making sure that we do what we have to do without too much negative impact on them. This week I'm back at uni, which is great (structure to my weeks! learning is fun! closer to graduating! ), but increases the stress level (assignments! classes, readings and self doubt!) and I received a challenge to write a bit more so I will be procrastiblogging a bit over the next few weeks. I want to write about nursing and bullying on prac, and how it relates to feminism and the performance of gender identity. I'm doing a mental health subject, one on the health of Aboriginal and Torres Strait Islander Peoples, I had a crappy time on my last placement and I have just finished Clementine Ford's 'Fight Like A Girl' so it's all swishing together in my head in some pretty interesting ways. Feminism and the performance of femininity: at what cost? Irony can be found anywhere. As I was shaving my legs this morning (!) I was thinking about something two things I saw and 'shared' on FB recently and how they both contradict and support each other in their desire to support feminists (as differentiated from feminism). The first was the ever-inspiring Chimamanda Ngozi Adichie in the form of a letter to a friend on how to raise her daughter to be a feminist. Powerful stuff, beautifully written and in essence I agree with every word. The second was sadder and more problematic. Less fire-up-the-imagination oratory, more back room strategy negotiation. 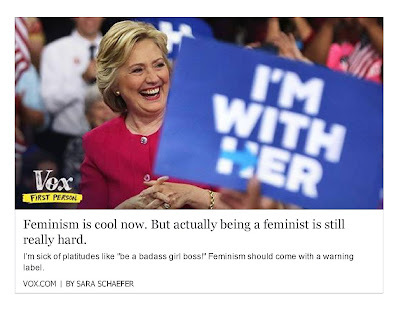 Basically Sara Scheafer says that if you behave how your feminist self knows you should behave in order to fight the patriarchy there will be real life repercussions. ...And this is really hard to live with. It's HARD to know that if you live up to your ideals you will be vilified. Yeah, strong words, but the amount rage and abuse women who stand up loudly for feminism get you strong stuff. There are lots of stories about women being in effect forced off social media with the weight of abuse they cop. It's hard to know that if you teach your daughter to fight the patriarchy there are ways in which she will suffer for it. She will suffer in different ways without it. You are damned if you do, damned if you don't. Read this and stop beating yourself up about those times when you feel like you aren't 'enough' - I was an awkward child who didn't learn femininity early and it made my life as a kid pretty difficult (there are quite a few FB friends who knew me in primary school and can attest to that). So next time you, your female friend, or someone your read about doesn't become 'a badass girl-boss' when confronted with male privilege, offer that person compassion rather than condemnation (especially if it's you! that's the hardest!). Fighting the kyriarchy is a long game and it's OK to play to your strengths and disengage in unwinnable battles and conserve your energy for fights that you have some chance of winning. Learn about oppression and keep your compassion and you are fighting the good fight my loves. ...and I started thinking. Thinking about my past, my childhood, the bullying, my depression and realising that one feminist reading of all that sad soup might be to do with me not 'learning femininity early'. People ask me why I was bullied, and I joke that it was the tattoo on my forehead that has since been removed. They want to hear there was a concrete reason - I had glasses perhaps, or a lisp? It wasn't anything so simple though; it was a combination of being smart, precocious, annoying, and not realising that the only way I was really allowed to be these things was quietly, not taking up too much space and not damaging too many male egos in the process. The boys who were similar me didn't really get a hard time. I never fit into the two stereotypes available for smart girl: I was too loud to be the quiet bookish type, too funny and irreverent to be one of the A+ students. I like this reading because it fits well with my schema and gives history and consistency to me as a mouthy 43 year old. The personal is political, dream life edition. I go through phases where I remember my dreams. They are often really funny, when they aren't tediously anxious (Why aren't I wearing pants? Why did they change the time for that very important thing that I have to go to, so now I can't get there on time? Why does this bathroom not have walls? All variations on a theme - anxiety is really, really boring). Often they feel like they are a message from my subconscious about the things that are happening in my life or current events but unfortunately my subconscious likes bad puns and is faintly cranky. Last nights dream was pretty funny. I have clearly been thinking about the wonderful writer Clementine Ford and her recent switch of some boys and girls t shirts in kmart, and the discussion around that. There was also a question on another Facebook group about where a local mum could buy 'gender neutral' clothing. I piped up with my standard rant about no clothing being really gender neutral (go on, google 'gender neutral clothes for kids' and you will get jeans and t shirts, traditionally male attire) anyhow, all this must have been on my mind. Dream-me was dressed as a bat trying to explain to someone that there was no gender neutral clothing, and things marketed that way were just boys clothes which reinforced the andronormative/androcentric world view. I didn't want to wear boys clothes or girls clothes so I was going to dress be a bat. At that point I was trying to hang upside-down on some stair railing and things got confusing. More confusing. But my fur was delightfully soft!